KUALA LUMPUR, 15 June 2012 – While there still exits discriminations against women at top level management, there is also the tendency of women themselves declining top leadership positions. Vice-Chancellor of The National University of Malaysia (UKM), Professor Tan Sri Dato’ Wira Dr Sharifah Hapsah Syed Hasan Shahabuddin said while it is true that the proverbial “Glass Ceiling” is holding back promotions for women, the women professionals themselves must also overcome their own guilt feelings or doubts about taking on more responsibilities. She was speaking at a forum on How to Make 30% of Women Scientists, Engineers and Technologists in Top Management & Board Room at a two-day Women in Science, Engineering and Technology International Conference, WISET 2012 here today. Based on her personal experiences, Prof Sharifah Hapsah said she found some of the women on the cusp of top-flight management back off because they feel that they had to put careers in the back-burners and focus on raising a family first. She said if the women themselves do not take on more challenging positions, it would only vindicate the stereotypes about females not being suitable for the boardroom. She was concerned that doubts by women would only be exploited by those who all along are opposed to women in management, for various reasons. When this happens, it might create a perception that women should not be considered for promotion to leadership roles. Malaysia, she said, has no shortage of the talent pool of women professionals in the scientific fields who have the potential of being high-flying managers. She advocates women adopt a flexible position balancing career and family needs so that they can find an equilibrum between home and the work-place. This also needs full understanding from the spouse. While employers in Malaysia are beginning to accommodate working mothers, we are still far behind the developed nations such as the United States and the Scandinavian countries providing nurseries for infants and children. 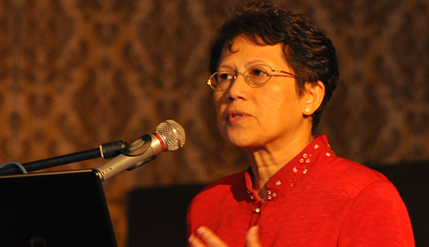 Prof Sharifah Hapsah said that in her field of academia, she came across highly qualified female scientists and technologists who declined promotions to head of faculty positions despite her recommendations and backing. Apparently the candidates for promotion were content to do lecturing work at regular hours. But by the time they are ready for high-level management, they might have missed the opportunity. Prof Sharifah Hapsah said she fully supports to having 30% of top positions filled by females, even if it is at the UKM only. Currently only 20% of managerial positions are occupied by women. If the 30% target is to be met, there must be unwavering support from top management in the government-linked corporations. Many women rise through their involvement in various activities at national and international levels thereby improving their confidence, she said. Her remarks were mirrored by other speakers at the forum. Institute of Engineers Malaysia (IEM), President Vincent Chen said the number of women in the technical, engineering, manufacturing and construction related courses in Malaysia stands at about 45 percent. Based on a report from the IEM, the country currently has about 71,000 engineers, of whom 15,000 are women, a vast improvement from the situation in 1969 when there were no women engineers and 15% last year.